To complete the package set Wilson have included a lightweight stand bag. The stand bag features an adjustable padded double strap system that will enhance carrying comfort and balance. An ergonomic Lumbar Support design provides the best possible protection to your lower back while carrying. Multiple pockets provide ample room for extra layers of clothing, golf balls and accessories. A seven-way divider top provides excellent club management that will allow you to store and organise the complete set very easily. The Wilson X-31 Steel and Graphite Package Set consists of a combination of shafts that will help you hit the ball straighter. A lightweight steel shaft has been used for the irons that will provide excellent accuracy. A reinforced lightweight graphite has been used in the woods to promote speed and distance. Aimed at the beginner or game improver, the X-31 Package Set consists of everything that a high handicap golfers needs to lower scores. 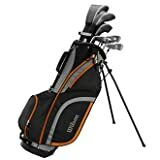 The set consists of the following clubs: Driver A large 460cc head made from a titanium composite with back weighting provides a stable impact position for improved accuracy and incredibly fast speeds for extra distance. Fairway Wood (#3) A low centre of gravity on the fairway wood will help launch the ball into the air and provide increased forgiveness for all round versatility. Hybrid An incredible long iron replacement golf club that is extremely forgiving and versatile from all types of lies on the golf course. Irons (6, 7, 8, 9, PW, SW) An oversized head construction with a low centre of gravity and a deep undercut cavity design will increase head stability to make sure those shots that do not hit the centre of the club face end up closer to your intended target. Putter A bladed heel and toe weighted design will provide excellent distance control off the face. And it will be super easy to line up. To complete the package set Wilson have included a lightweight stand bag. The stand bag features an adjustable padded double strap system that will enhance carrying comfort and balance. An ergonomic Lumbar Support design provides the best possible protection to your lower back while carrying. Multiple pockets provide ample room for extra layers of clothing, golf balls and accessories. A seven-way divider top provides excellent club management that will allow you to store and organise the complete set very easily. This entry was posted in Golf and tagged 2017, Mens, Package, Steel/Graphite, Wilson by FPSports. Bookmark the permalink.